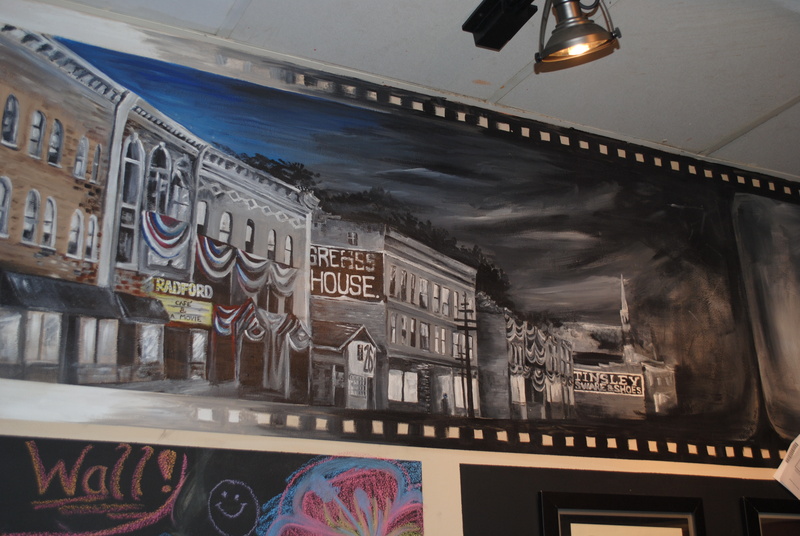 A mural of downtown Radford inside Main Street Cafe. Courtney Earll | The Tartan. Main Street Café is a new little café that opened this past December. David Allen is the general manager and owner of the café. He acknowledged that even though opening a restaurant is one of the hardest things to do, he’s wanted to do it for a long time and is excited that it has actually, finally, happened. So far, business has been really good for the café. “January was double than December… and what we did in January was done by February 13,” Allen said. So if business has been so good, there has to be some delicious items on the menu. According to Allen, the most popular item on the menu is the “chicken focaccia” sandwich. Allen showed an example of how this sandwich was made, and they take an interesting approach. They slice a thin piece of focaccia down the middle and then, instead of using the outside of the bread as the outside it is switched and made to be the inside of the sandwich. According to Allen, this is done so that you bite through something soft instead of something tough. In addition to the chicken, there is fresh basil and tomatoes on this sandwich. The café has a full menu of gourmet sandwiches, soups and coffees, and this spring they will probably be adding smoothies to the menu. Additionally, many of the items on the menu are gluten free, including the meats and cheeses. “You can come in and spend more than five dollars and you get to spin [the wheel] around and there are no losers. You can get 10 percent off, 20 percent off, a free coffee, a free latte, a free soup, a free sandwich. Every single Sunday from start to finish,” Allen said. Overall, Allen looks for quality and generally good personalities to help keep his shop going. Guest services are a really big thing inside of Main Street Café which is what Allen feels makes his café different than the others. Live music is often featured inside Main Street Café. They are open Monday through Friday from 6:30 a.m. to 8 p.m. Saturday they are open 8 p.m. until 10 p.m. and Sundays from 8 a.m. until 8 p.m. You can also check them out their Facebook page, as well as their website at mainstreetcaferadford.com.